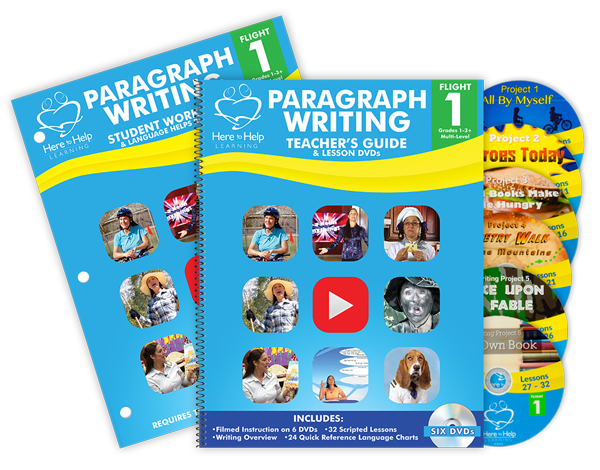 89.99 includes teachers guide with six DVDs and one student workbook. Automatically receive weekly updates and writing tips. Web membership will always have the most current addition of the videos and worksheets. Great value if you have children in both the paragraph and essay writing level, your membership will serve your whole family for one low price. Excellent choice if you do not have reliable internet. Student workbook is in color. You may reuse or resell the DVD kits. Saves your ink and time printing the worksheets. Hint: If you can stream videos without a problem, you will be able to have an enjoyable web membership experience. Student workbooks are consumable. You will need to reorder for future use. Personal printers vary in printing cost depending on your machine. For an accurate cost comparison, you will need to calculate the cost per page for your printer. Each flight (one year of instruction) has approximately 200 pages. Please note: The first lesson of the unit/writing project has about 10 pages to print. The remaining lessons in the unit has only one-two pages to print. Ink jet printing costs (black and white) will range from $14.00-$16.00/year or .07 – .08 /page. Cost will be much lower on laser printers. Helpful Hint: Print only the student worksheets. Use another device such as a tablet/pad or your cell phone to access the “teacher scripted lesson” rather than printing. This will reduce printing by 32 pages.